Here I will cover HEROCoin, H2O, and wys. As Cointed was accused of fraud, it deserves a more detailed look and I will do so separately. The lack of an economic model for the coins: I believe that the issued coin should be tied to the startup’s business model. HEROCoin is the only one where this is the case. The lack of target audience for the ICO: With wysker, for instance, I have shown that it is not clear if they are targeting people who want to invest in an idea or a product. byte heroes, the company behind the e-sports betting platform herosphere, issued the first ICO compliant to Austrian law (by working together with the law firm Stadler Völkel). They finalized their ICO on 16th October, raising 2 Million USD instead of the hard-capped aim of 14 Million USD. Their coin, the HEROCoin, can be used on their Ethereum-based betting platform HERO network. The HERO network cuts the middlemen out of the bets and thus enables users to bet directly against each other. Ethereum’s smart contracts ensure that each participant gets the payouts she is supposed to get. Simultaneously, each participant can create her own bets on the HERO network. Initially, byte heroes is going to deploy the HERO network on their own, 200,000 players-heavy, herosphere.gg platform. Great about the HEROcoin is that its existence is justified by an economic model. The coins, also referred to as HERO, are the rewards and incentives of the network and thus an integral part of herosphere.gg. The other part that justifies HEROcoin’s existence is the companies’ vision. In the long run, they want to open the HERO network beyond online esports betting and offer it to other online betting providers or game developers. As an example byte heroes mention a Twitch user who could create his own contests on the HERO Network. Whereas users still can only use the coins in the HERO Network, they won’t — at least that is the vision — be restricted to herosphere.gg. This stands in sharp contrast to, for instance, Gilgam.es, an E-sports platform, which finished their ICO in July and whose coins can only be used on their platform (See Kyle Wang for more info on Gilgam.es). Remarkable about their white paper is the level of detail about the founders and advisors. Financial details (projections, cost estimates per stage, teams’ renumeration etc. ), milestones and competition overview, however, lack detail. 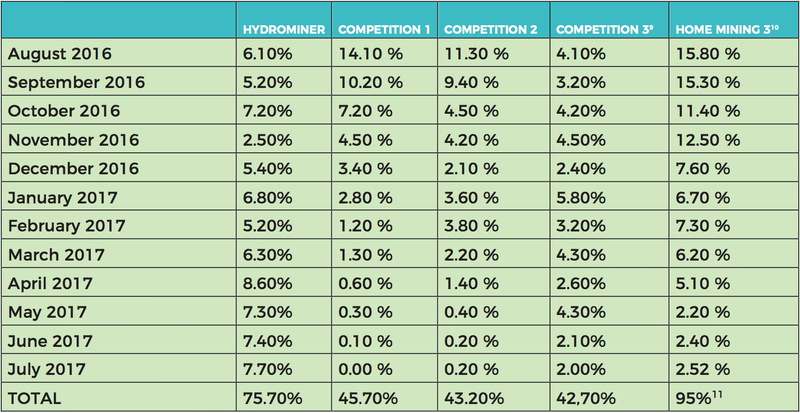 HydroMiner, mines bitcoins using renewable energy, concretely water. Their mining rigs are connected to hydro stations in two Austrian cities (Bruck an der Mur and Langelois). Through that they are apparently able to reduce the energy costs down to three cents per kilowatts. In Austria you usually pay between 14 and 23 cents. Initially, they wanted to distribute their token called H2O as dividend-tokens (and start in September) but had to switch to vouchers (mining-contracts for their platform) because dividend-tokens are forbidden in Austria. Their ICO is scheduled for 18th October, and a maximum of 25 Million H2O is available. Their coins’ justification is, in contrast to HERO Coin, less viable. HydroMiner wants to use to the capital from the ICO for scaling their operations. In contrast to HERO, owners of the H2O coin do not own the coins for a system-specific reasons, besides the general increase in value. Of all the white papers discussed here, HydroMiner has the most detailed milestones plan, even considering that it lacks a timeline. Something they have in common with wysker is how careless their competitor overview is, which in this case, is anonymous. Whereas one could shrug this of as nitpicking, a company that wants to raise up $77 Million should be more diligent. Remarkable about the founders Nadine and Nicole Damblon is that neither of them has a technical or financial background. On the one side, their success up until now is, therefore, impressive. On the other side, however, one has to question whether their non-economic/technical background will be a downside in the future. They, however, both have experience in the crypto field as they have been mining since 2014.
wysker shows you up to 20 product images per second (yes, seconds. And yes, 20). Once you pick a product, you are redirected to the seller’s website where you can purchase the items. wysker was founded in 2016 and has raised €45,000 in funding so far (Crunchbase). Then, on October 1st they started their ICO Presale for their wys token, and their ICO is scheduled for November 1st and will last until December 1st. 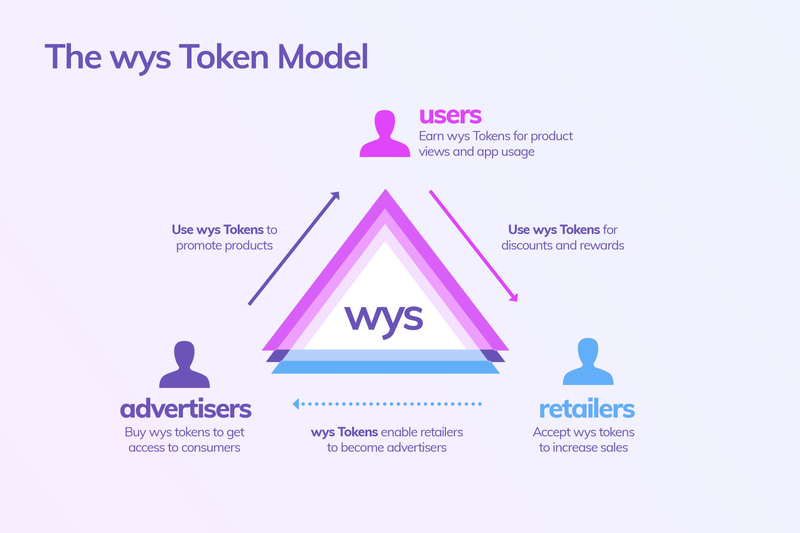 With their wys token wysker wants to build a three-sided network within the app, consisting of users, retailers, and advertisers. Users earn wys tokens by using the app, through, for instance, product views. In essence, exchanging data for tokens. These tokens can then be used as a currency within the app. Advertisers in turn (who simultaneously can be retailers) use these tokens to promote their offering. Information between users and advertisers or retailers flows only with the owner’s consent, i. e. only if you want to share your data (e. g. product preferences) the other parties get it. They are rising in Germany, but are going to start firstly in the USA. This construct is not a problem, the issue, however, is that they do not disclose that information in the white paper. wysker does not provide any launch date for other markets. Although it is Germany’s first ICO, it does not get much international attention. Their German and English threads on bitcointalk (the biggest forum around Bitcoins and crypto tech) have five pages in total. In contrast, HydroMiner and byte heroes have 27 and 37, respectively. One reason for that might be their economic model. Looking again at coin justification and economic model, the biggest use of a (not their) cryptocurrency here, are the non-existing (or low) transaction fees. Depending on the products’ margins can be low and transaction fees high. Thus, using cryptocurrencies to avoid margin-eating transaction fees could either lead to lower prices for consumers or higher margins for suppliers. However, transaction fees alone do not explain why wysker is creating a token on their own. As wys tokens per se are not tied to the business, an existing coin would have been equally suitable. Nevertheless, in the long run, wysker wants to integrate the coins into other platforms. How exactly, however, they do not elaborate. To somebody without industry knowledge, what wysker has presented is misleading because it implies a real relative advantage which is not present as, for instance, Pinterest and Instagram have a purchase button. However, wysker’s success will depend on much more than their UX. Amount and type of products are the two biggest drivers here. According to the white paper, “The product catalogue on wysker is constantly growing and includes various categories ranging from fashion to tech, from games to decor, and from beauty to accessories. The product catalogue is virtually endless.” Unfortunately, that provides basically zero information about what they really offer. The wysker Platform will focus initially on the mobile sub-sector of the e- commerce market. In the US, the total e-commerce market size was $520bn in 2016 . The share of the mobile subsector was 19% totaling $80bn. Beneficial for wysker is the growth prediction of the mobile share. It is expected that the mobile share will reach 45% of the e-commerce market by 2020, totalling $284bn. Data confirms that one of the biggest trends is still the shift towards mobile commerce. Consumers also increasingly demand high-quality and personalized content. wysker is leveraging these trends: e-commerce growth, shift to mobile, and evolving consumer preferences. Especially worth mentioning is the last line which not only has a certain buzzword smell to it but is also a big truism: “wysker is leveraging these trends: e-commerce growth, shift to mobile, and evolving consumer preferences.” Whether an ICO white paper should contain a competitive overview at all is for debate (I am tending towards yes), but in this case you either do correctly or not at all. Another thing I believe you should either do correctly or you not at all, are predictions. Predicting anything is difficult, especially the value of crypto coins, and especially the value of non-existing crypto coins. However, their predictions of wys tokens look good, but nothing else. A prediction that is missing completely are financial projections. Sure, this is difficult (but at least they could have provided financial projections to relatively predictable costs such as salaries) and sure they are not required to do so, but the lack of it ties into a general problem of white papers (lack of target audience) which I will explain further down. Great, however, is that they have announced to update the community with metrics; “user numbers, retention rates, and first sales volumes”. Not the most useful metrics, but great that they want to report at all. None of the other two companies, by the way, has provided any measurable metrics at all. What is missing in regards to the product, however, is a clear product strategy (go-to-market strategy, etc.) and roadmap. Although I do not want to talk too much about wysker itself here, I want to touch briefly onto their vision in the context of their positioning. I am all for bold strategies but also for realistic ones. Claiming that the “future of digital commerce” consists of the wysker app and the wys tokens is very bold, but also very unrealistic. In fact, we do not even know what the future of cryptocurrencies for the next twelve months is. Furthermore, I consider this claim an exaggeration because they do not differentiate between commerce and e-commerce. Recall the buzzword/truism-smelly line from above: “wysker is leveraging these trends: e-commerce growth, shift to mobile, and evolving consumer preferences.” This line ties very well into a problem I see with white papers in general, namely the lack of a target audience. People who need an explanation of the trends driving wysker are people from outside the industry. 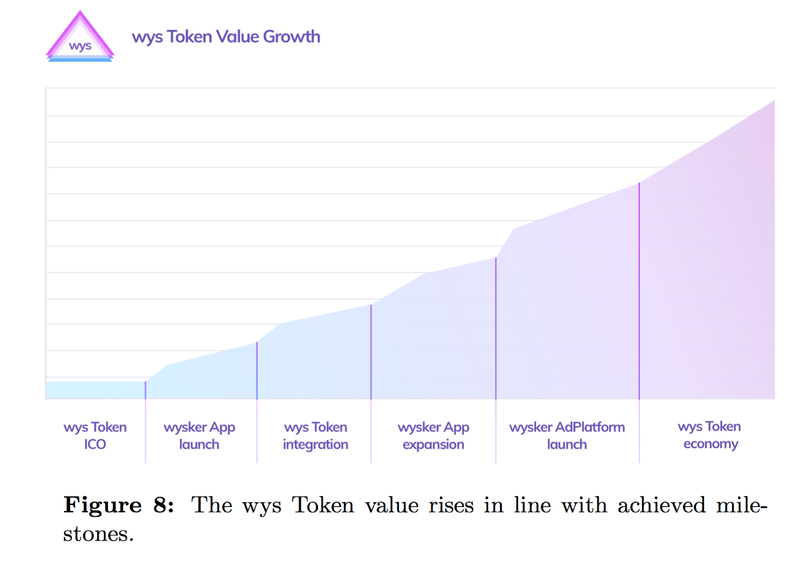 Furthermore, their figure-less graphs predicting wys token’s value from above, imply that the only thing they want to show is that the token’s value is going to rise. The same rationale goes for their market definition. wysker has a huge market, that is all you need to know. The general message is: we have a great idea and huge market. Whether we can turn that idea into an application (no roadmap, product strategy, etc.) is not important. This, in turn, implies that they want the actual app users to invest (in fact, they address the user directly in their paper with their “Introduction chapters” “You Don’t Own Your Data” and “Your Data is Your Future”). Opening up to the “average” user is fine — else it would negate the sense of an ICO — but in this case, I firmly believe that it is the company’s obligation to be perfectly upfront with non-expert investors. If you have invested in any ICOs before or even in of the ones mentioned here (or a planning on doing so), please let me know, I would like to hear about your experience and thoughts around it.